Based in the small western Victorian town of Dunkeld, Trevor Flinn is an idiosyncratic cross-media and socially engaged artist whose “observations of place often play out in tangential responses involving non artists and the re-working of everyday objects in ‘live art’ events staged in unusual settings” (Bundanon website). Since 2010, Flinn has created works for Next Wave and a variety of regional festivals, often working with locals and focusing on the characters and lore of place. 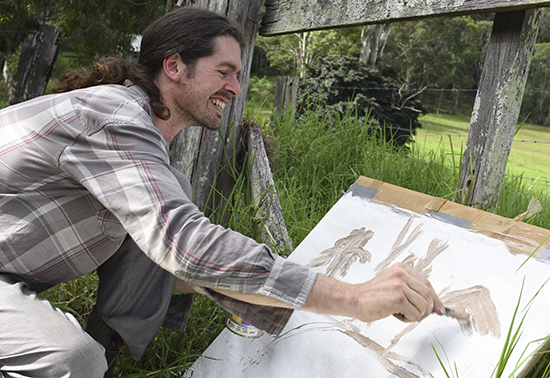 He has also helped develop TWIG, a partnership with Australia’s Creative Rural Economy (ACRE—artists on farms) that saw him work with farming families in the Mallee region around Swan Hill and Esperance. On 7 April this year, Flinn texted a friend: “I’m currently mid-way through a dream residency at Bundanon. Something that came out of the blue and something very timely. I found last year pretty taxing in some ways so nice to recharge and stir up the creative juices again…[It’s] very inspiring and rejuvenating. The country here practically hums with creative possibilities. The following is Flinn’s generous response to RealTime’s request for an account of his experience of his stay at Bundanon. “The country here practically hums with creative possibilities,” seems to sum up my time at Bundanon. From the moment I arrived I felt the surge of energy and enthusiasm that accompanies the creation of new work. I had come with a plan to tap into the farming side of Bundanon and focus, among other things, on the abundant weed varieties in the area, including the infamous Lantana Camara, a weed of national significance. However, it wasn’t long before the place started to work its own peculiar magic on me and the solid plans I had concocted months ago evaporated. My comfortable digs and spacious adjoining studio space demanded that I nestle in and embrace the incredible countryside around me. At first it seemed enough simply to greet the sun with an early morning dip in the Shoalhaven, or commune with the wombats on quiet bushwalks in the golden light of the late afternoon, but before too long I felt myself becoming increasingly drawn to the landscape that Arthur Boyd made his own, and compelled to respond intuitively to my surroundings. At a certain point I even seemed to be channelling the great man himself. I made a stretcher from purloined tree stakes and primed a large piece of material using melted granules of rabbit skin glue. I set myself up under a tree on the banks of the Shoalhaven and as the late afternoon light turned the rocks on the opposite bank a warm pink, I attempted to capture the scene in paint which I smeared across the canvas in a wild frenzy. The Easter weekend suggested to me the possibility of creating a small ‘artistic intervention,’ so I set about clearing a tiny piece of lantana-infested bushland that could only be reached by crawling along a series of wombat tunnels. Like Alice in her proverbial Wonderland I discovered a secret place safe from intruders, surrounded by scented flowers, home to countless grass tics, hungry leeches and fat little glow worms that would respectively feast on my blood and light my way home. I lit a small ceremonial fire in the middle of the clearing, and as the full moon rose and the Milky Way crept around the sky a strange calmness descended upon me. After waiting for my fire to go out I returned to ‘civilisation,’ leaving behind a small pile of ashes and little wombat effigy that I had fashioned from mud and sticks. These humble offerings to the land would quickly melt into the soil and be swallowed up by the lantana and, like countless visitors before me, my time at Bundanon would become but a distant memory. I feel privileged to have experienced the unique gift that Arthur and Yvonne Boyd left behind. Their generosity and foresight has enabled so many to share in the delights of a landscape that both nurtures and inspires. The creative outpouring that occurred during my visit reminded me why I have devoted myself to the process of art-making and how important it is to remain present and open to what is right in front of you. Make your residency application for 2018 here.